The quickest route to a relaxing weekend? Anyway, the plan was to look for a wooden work surface for the campervan kitchen. This was an about turn really; we’d always been keen to avoid the traditional pine look that you see in so many pictures of converted campervans, and were planning to use a pale laminate for the kitchen surfaces instead. But Paul loves working with wood, and was concerned that the interior was starting to look too white and sterile. I am inclined to think once we introduce the red cupboard doors and stripy seat cushions it’ll be hard to see any white, but I do quite like the idea of a solid wooden surface. Like one huge chopping board. So we’re hitching a brief ride on the pine-look bandwagon and have bought an Ikea Lagan worktop. It was almost 2.5 metres long, weighed over 30kg, and only just squeezed in the car (barely leaving room for my Ikea purchase: a single fluorescent dishwashing brush, which was looking a bit forlorn at the bottom of my huge yellow bag). 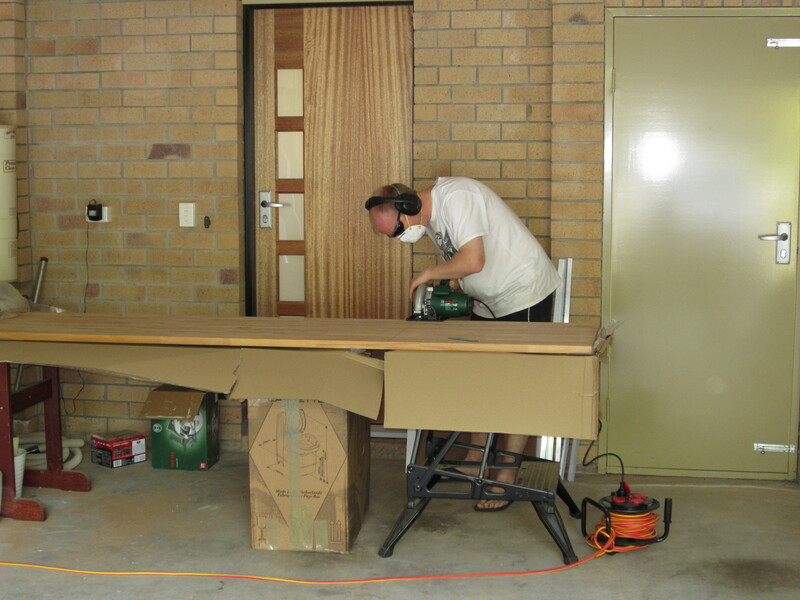 Paul’s cut two pieces of wood to fit each side of the kitchen and has given it about five coats of timber oil. He chose a Danish wood oil in the hope it would get along nicely with its Swedish wooden companion. In other news, Paul’s been doing some finishing touches on the cupboards and has boxed in the wheel arch at the back of the main kitchen cabinet, using the same laminated wood he used for the walls. He’s also completely secured the toilet to the floor, which I am relieved about because I find it quite a comfy place to perch while Paul’s working, and as our driveway is on a slope, I was always in slight danger of sailing off down the van. Fixing the toilet was quite tricky, we couldn’t get long enough screws to drill far enough into the floor, and the limited space in the base of the toilet made it awkward to get the drill in to screw down. So Paul went underneath the van and used long bolts to drill up through the base of the van and through the floor, and secured the bolts with nuts in the base of the toilet. 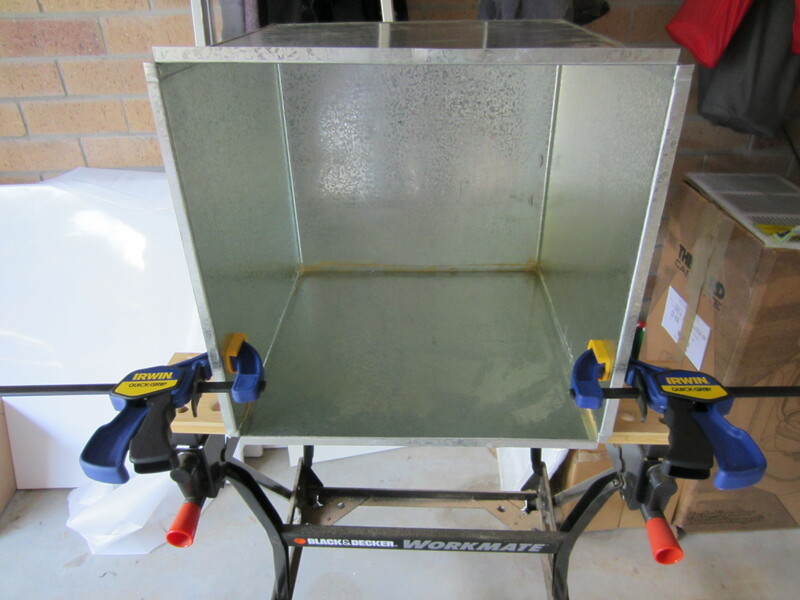 This is the steel box that Paul has resized for the gas bottle, so it will snugly fit our 2kg gas bottle rather than the 9kg one it was intended for. A bit of hacking and a lot of sticking has saved us sending the original box all the way back to NSW. Earlier this week we had a bumper delivery from Caravans Plus which included a stove, kitchen sink and roof fan, so Paul’s going to tackle some of those this weekend. 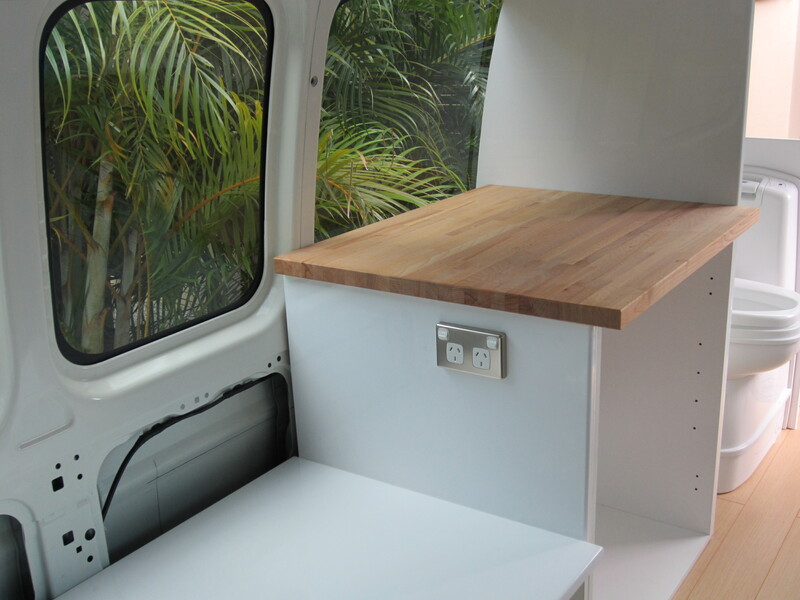 This entry was posted in Building a diy campervan, Camper supplies, Campervan life and tagged a relaxing Easter, campervan cabinets, Campervan conversion project, campervan kitchen, campervan sink, campervan stove, campervan ventilation fan, campervan worktop, Caravans Plus, Converting a campervan step-by-step, Danish timber oil, DIY campervan, frazzled shoppers, gas bottle case, how to fix a campervan toilet, Ikea, Ikea Lagan worktop, Monopoly, PAcific Highway, pine avoidance, Scandinavian friends, sturdy toilet by Rach. Bookmark the permalink. Just two comments though – where is the carpenters safety boots!! Where is the Gantt Chart taped to the wall?? Hi Neil, good question re the boots. Paul has eye goggles, ear protectors, dust mask, hard hat, high vis jacket (that’s not usually necessary though), and wears them with … flip-flops. Which I’m sorry to say are increasingly being worn with socks now it’s getting cold. The gantt chart is top secret apparently, not for public release I’m afraid. Technical question this, maybe one for Paul! How do you do “a lot of sticking” to a steel box? Is this welding or riveting, or are you able to buy glue strong enough to bind the steel togther? Very impressed. 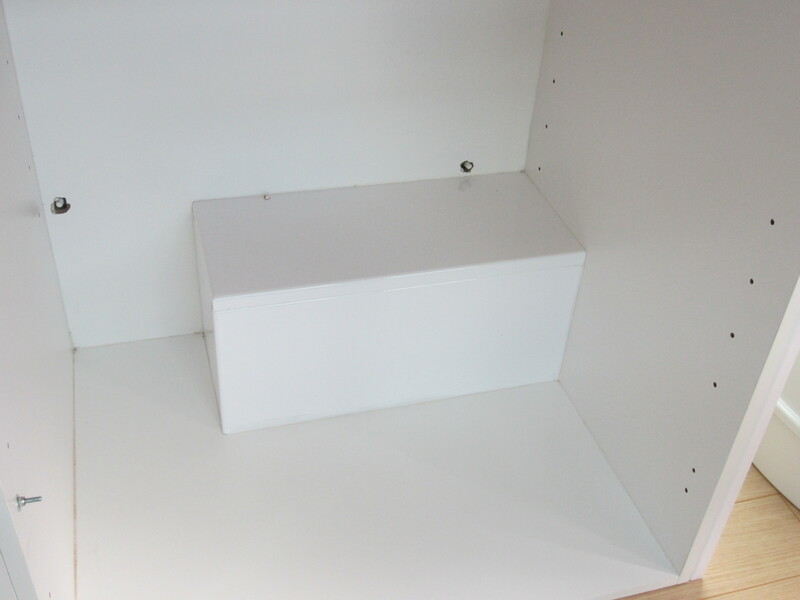 Good idea too about the Ikea worktop. I didn’t realise they sold decent bits of wood like that but I can see them too on the UK website (best you don’t look at that, there is a hefty price differential! ).